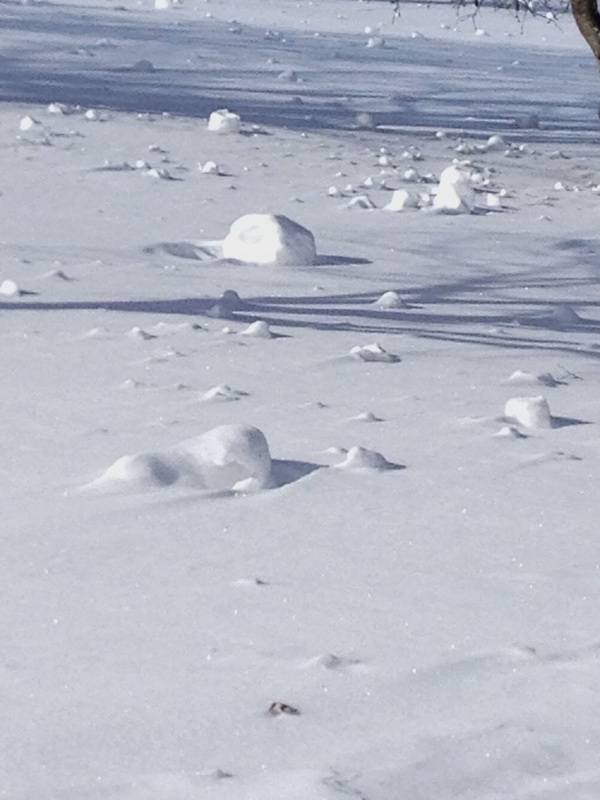 When we looked out into the yard last Monday morning, we were astounded by the sight of "snow rollers," although at the time we didn't know what they were. 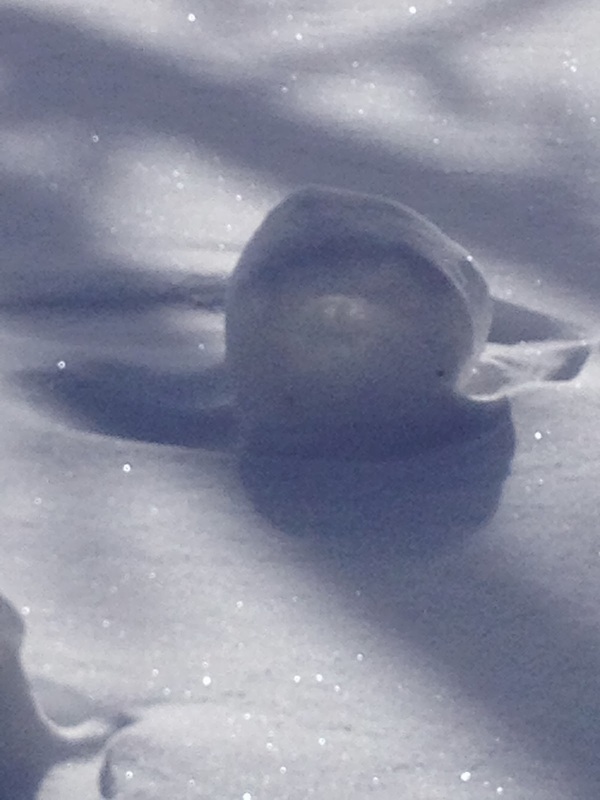 The entire yard, all our fields, were dotted with balls of snow of all sizes. We theorized as we walked to and from the barn to feed the horses (in the sub-zero temperatures) that "That sure must have been some wind last night" and "Look how this one just rolled down the hill!" As we learned during the day, this was indeed a rare phenomenon, one that occurs only when all the perfect meteorological conditions exist at the same time. As I drove into town later that morning, it was absolutely breathtaking to see that the entire area had been sprinkled with these ethereal looking snow masses. It has been one weird and terribly frigid January -- the coldest in a century, I read -- and I for one will be anxious to hear the groundhog's report this weekend. Spring can't be soon enough. With a few changes made possible by my pantry contributions, I had this chili ready in less than 20 minutes. And then I carried my bowl into the living room and sat by the fire. Winter can be good. Heat a soup pot over medium high heat. Add oil. Add chicken and saute about 4 minutes. Add onion, garlic, cumin, oregano and red pepper; saute 3 minutes. 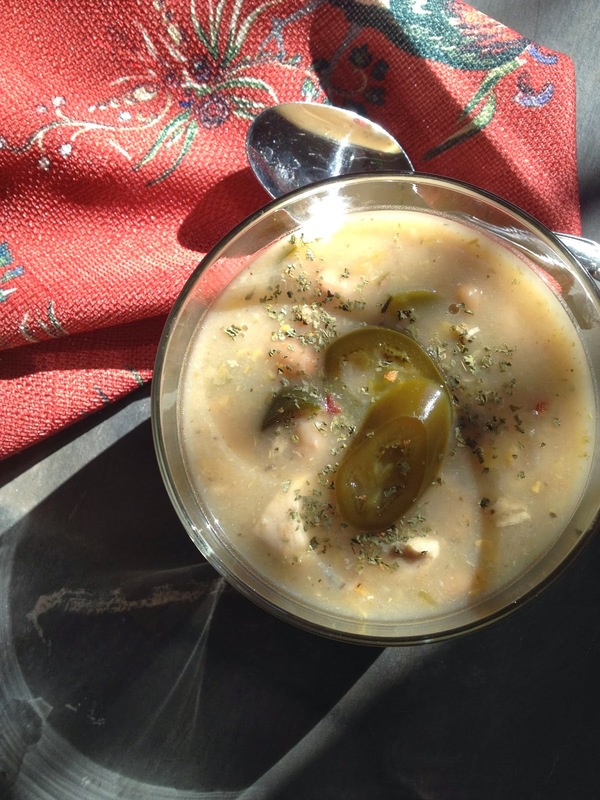 Add 1 can of the beans, the can of creamed corn, the water, 1 can of the chilies, the fresh jalapeno and the broth. Mash the second can of beans with the second can of chilies in a bowl with a fork. (Or puree in a food processor.) Add to the soup and simmer 5 minutes. 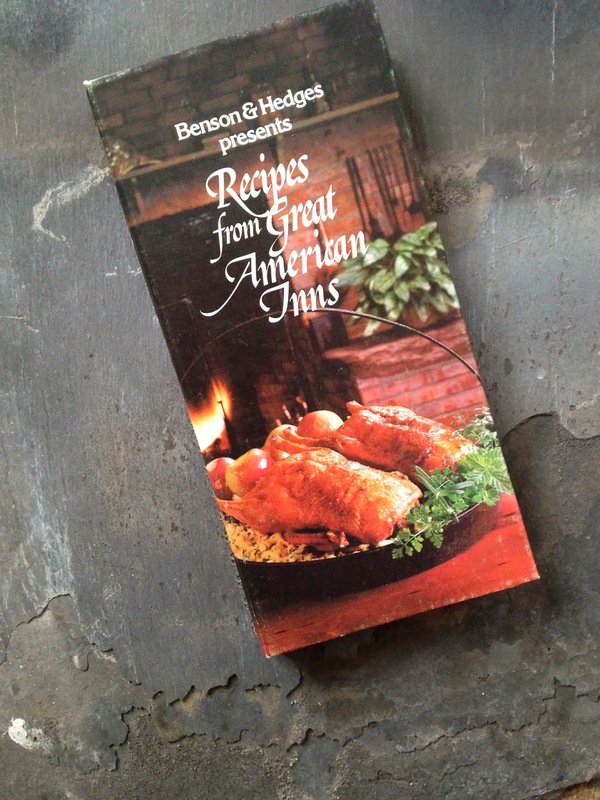 Although promotional cookbooks still exist, none can compare in quality and class to those produced by the masters: Benson & Hedges. Their marketing people were geniuses. They managed to commandeer the cooking prowess of the likes of James Beard to partner with them in creating honestly great cookbooks! For those non-smokers (or youngsters! ), Benson & Hedges is a brand of cigarette originally produced in Great Britain. When Philip Morris bought the brand in the 1960's and extended the length of the cigarette to 100 millimeters and put their marketing machine to work, a bold marketing campaign was unleashed and we benefited from these cookbooks! The cookbook I got this cauliflower recipe from, "Recipes from Great American Country Inns," was part of a pile of cookbooks my sister gave me. Another cookbook collector, my sister was dividing her spoils with me after a friend of hers (another addict, to be sure) cleaned house. I picked this recipe because the page was dog-eared. I figured someone else must have liked it. While it was good, it wasn't a bell-ringer, just a nice mild accompaniment to a spicy dish.I would like to try the Peanut Soup from the Wayside Inn, in Middletown, Virginia. Or maybe the Braised Lamb Shanks, from The Golden Lamb in Lebanon, Ohio. So how does my version compare with the pro's? By the way, "Nivernais," for the French-challenged like myself (despite four years of study) is a former province of France. I'm not sure what makes it "Nivernais" or even French. Is it the mustard? The cream? I know I have difficulty trying to name something I've created. A geographic appellation is often used but I can't imagine naming anything I've created "a la Fisher," my little village! via Benson & Hedges "Recipes from Great American Country Inns"
Cook the cauliflower in boiling salted water for 5 to 6 minutes. Drain and cool slightly. Combine the mayonnaise, sour cream, mustard, cream , lemon juice and salt. 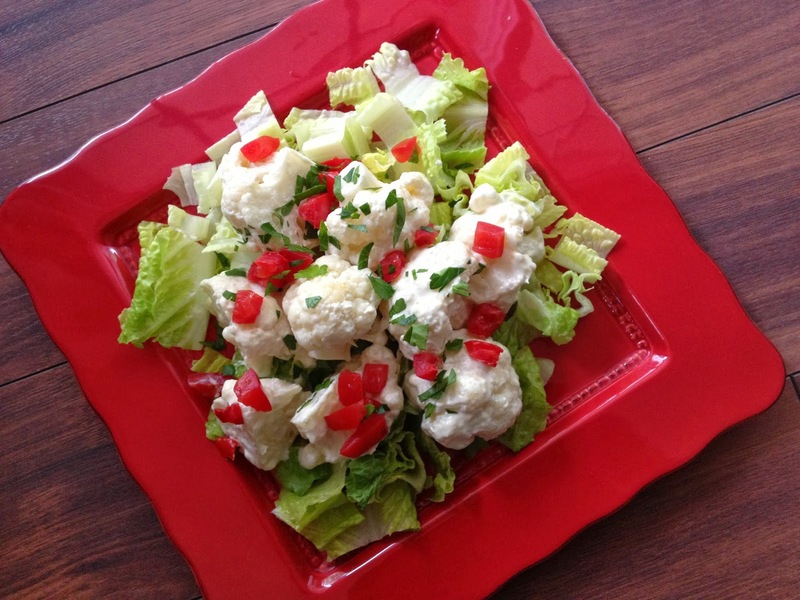 Toss with cauliflower and chill. To serve, toss with torn lettuce leaves and garnish with the pepper and parsley.